At first, this is a not very common use case but nevertheless it partly appeared to me, so not that unique. How do you make your bank account more secure? 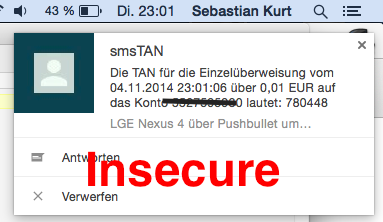 Yes, we use SMS to send TANs on each transaction we want to initiate. In general a very secure method because of a third party (your mobile device) in between. Now let us assume you use Pushbullet, an awesome service for displaying notifications received on the mobile device directly on your computer screen. This breaks all your secured process.